With the advent of DDR3, DDR2 has lost it's luster for those looking for sheer speed. 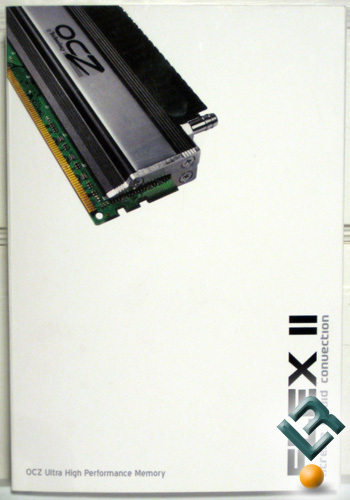 However DDR2 still offers the highest memory densities with decent speeds and reasonable prices. The OCZ 4GB Flex II PC2-9200 kit offers the enthusiast a taste of speed and flexibility while also including a healthy 4 gigabytes of memory for RAM hungry applications. 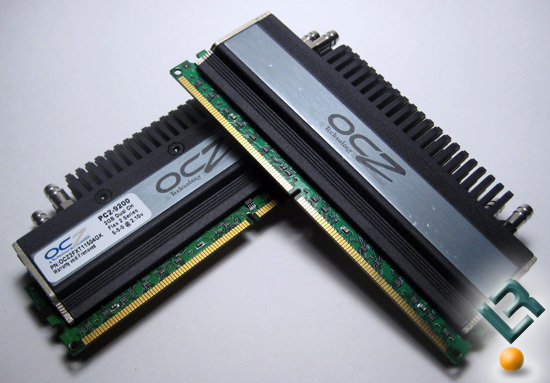 OCZ is one of the major memory manufacturers for the enthusiast community with a far reach into consumer RAM along with power supplies and solid-state drives. OCZ has completely embraced the enthusiast with their multi use heatspreaders and warrantied Extended Voltage Protection options for their memory modules. The OCZ 4GB Flex II PC2-9200 modules I have here today feature some of the highest frequencies on the market with CAS5 DDR2-1150. The OCZ Flex II Xtreme Liquid Convection heatsink is a central feature to this kit. These thick heatspreaders feature dedicated aluminum channels through the modules that cool each individual IC on the sticks. In addition to these water cooling channels, the heatspreaders feature a finned array to let the consumer choose between watercooling and air cooling. This flexibility is only one of the features from this memory kit that earns it the name "Flex". If this kit looks familiar to you it mihg tbe because we were one of the very first sites to cover this new heat spreader back during CES 2008 in Las Vegas!